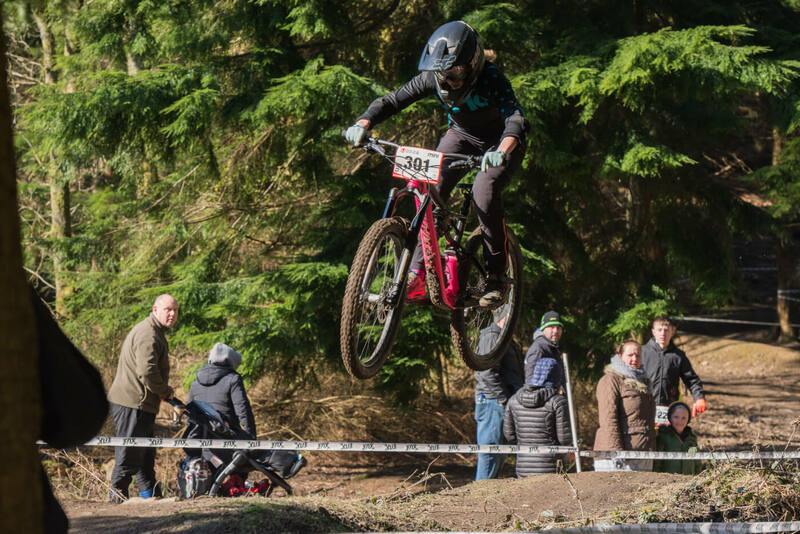 With a few things going on outside the world of biking I was really looking forward to a positive weekend on the bikes practicing and racing in the next round of the Onza Mini Downhill at the Forest of Dean. The weather on the weekend was beautiful, cold but sunny and bright. I wrapped up warm and felt relaxed and happy heading up for Saturday practice. I had a completely open mind about the track and no idea what to expect as it was a new track, or a revamped old track? I’m not sure, but I had never ridden any of it except the very top and the bottom before. The top section was fine, there was a pedal out the start over a hump and a dip, which I think some people jumped, in to quite an awkward right run round a tree, a few tight corners and a drop on to the fire road. The second section after the fire road is where things really got interesting, with a fast drop in to some off camber roots and then in to a few line choices around some bigger roots and stumps and then in to a tight left corner to start the slalom like section. This was the real nemesis for me on this track. Tight twisty corners are not something I ride a lot and I found it really quite tricky to find my flow through this part of the track. This led back in to the existing bottom section of ski run, which has its own tight right corner in to the bottom jumps section, with a couple of smaller tables in to the big “double” (ish), and then over the road gap, catch berms and in to the finish line. Saturday practice could have gone smoother, with a few frustrating mechanicals and about a thousand (maybe slight exaggeration) failed attempts at the tight left at the start of the series of tight corners. Race day practice got off to a good start, following Aston down the first run; I managed to get down the track relatively smoothly and conquered the awkward left corner I had struggled with on Saturday. There were a lot of red flags in practice as riders set of in trains and crashed in to each other when they got caught out by the tight corners which meant big queues at the top and stop start runs. Practice runs did give me the opportunity to get a couple of runs in with Elin, an incredible, modest and talented young rider who was part of team Flow last year. She takes everything in her stride, restarting from the fire road where there were a lot of people battling to drop in, and faster riders flying through making it hard for us to set off together, and it can quite frankly be a bit intimidating. After I had set off another rider had dropped in between us leaving her on her own, what would have shaken me as a 12 year old, didn’t bother her and she was still grinning when she got to the bottom and said how great Si the marshal and some of the other riders had been making sure she got some space to have her turn. Race runs were predictable for me, I got 2 steady runs in, I made the tricky tight left but then struggled and stalled a bit through the tight corners and losing time there but I put 2 safe runs in with very similar times. I was sitting in 4th after the first run, but with some cracking times from the girls, I slipped in to 5th after the second run. At each race I learn more about my strengths and weaknesses and what I need to work on, in this case tight corners!! Over the winter I have been training as much as is possible with a mentally and physically demanding full time job and adult responsibilities, and I remain optimistic that at some point it will all come together. The level of competition in the girls races is high and the bar keeps getting raised which is great! As always it was a really fun and friendly race weekend with lots of supporters and photographers braving the cold to line the track and provide encouragement to all of the riders. The mini downhill series is always particularly good for the girls, as it is one of few downhill race series that split the ladies in to multiple age categories which are sponsored by Flow MTB.